"Administrators and Faculty Seated in the Chapel, Commencement ca. 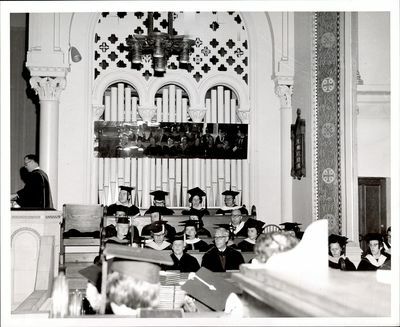 1960"
Administrators and Faculty members are seated in full regalia in the choir sections of the Chapel. A rectangular mirror above the people in the foreground reflects the faces of those seated across from the other side of the room.